Thrifty By Design: Bring on the Xmas Crafternoons! December and Xmas are fast approaching! I have 3 Xmas Crafternoons lined up... This month I'll prep samples, collect supplies and get ready for upcycling awesomeness with my peeps. Here are the 3 upcycling workshops. I'll post details on what we're making in the next couple of weeks. Hope to see you at one of the below Xmas crafting happenings! I'm partnering with Guildford Library for a Xmas upcycling workshop on Saturday, December 3rd from 11am to 1pm. Stay tuned for details! 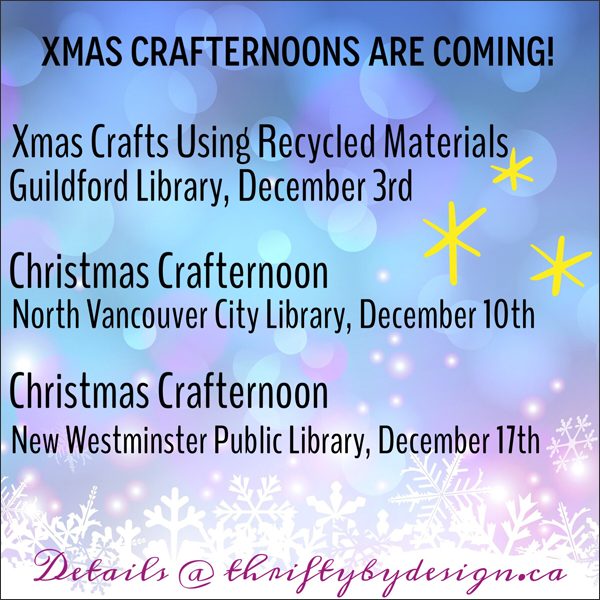 I'm partnering with the North Vancouver City Library on Saturday, December 10th from 1:30pm to 3:30pm for a Christmas Crafternoon. Details to come! I'm partnering with the New Westminster Public Library on Saturday, December 17th from 2pm to 4pm for a Christmas Crafternoon. Details to come!